In hopes of getting you all motivated to eat your veggies, today I’m bringing you my favorite soup recipe. I fell in love with a curried cream of carrot soup years ago but it calls for heavy cream and we all know that doesn’t exactly fit the skinny food requirements I’m trying to live by. I’ve modified the original recipe to fit my healthy, low-fat diet. This soup is delicious and sure to please almost anyone! I’ve removed most of the fat but kept the TASTE!! Add onions, cook until the onions are soft and starting to change color. Add the garlic, and spices and saute a few minutes. 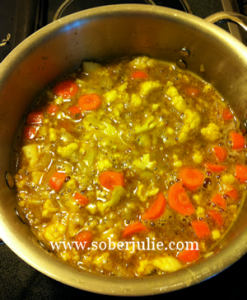 Add carrots, cauliflower, and water. Simmer, covered, for about 25 minutes. Serve each bowl with a swirl of coconut milk. It makes me wish I cooked! Looks so good. Can’t you just mail me some? 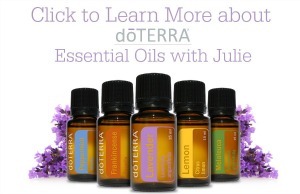 This looks fantastic Julie; I will be trying this one. Love curry on occasion. ooh! love that it does coconut milk instead. i can’t have cream. thanks! That sounds and looks delish! That would be perfect for today since it’s been non stop raining out here. Oh my! That looks yummy and so easy of a recipe. 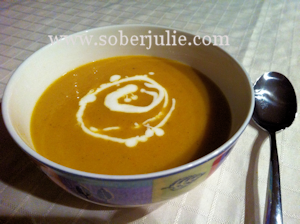 I love my soup and I love all kinds of curry – thx for idea! What a unique soup. Interesting combintation! Very nice presentation! That could be anything in those bowls and I would try it just because of the way you’ve made it look!